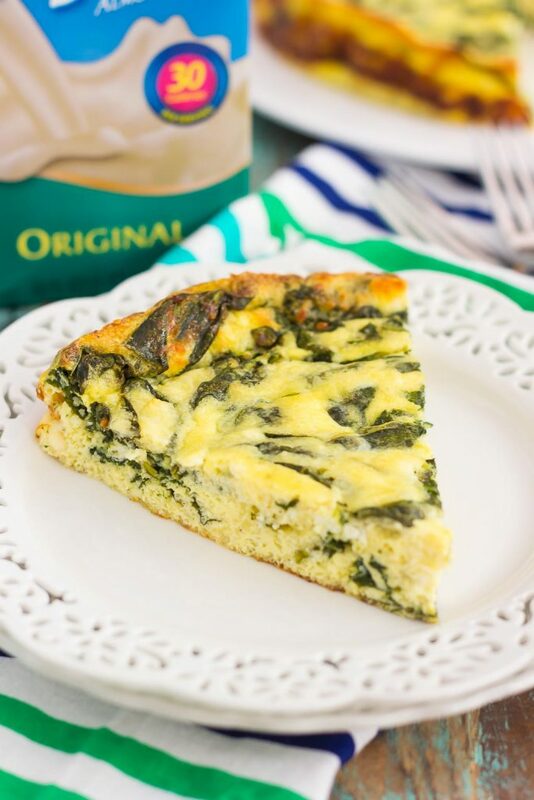 This Spinach and Feta Frittata is full of fresh spinach and creamy feta cheese. It’s healthy, gluten free, and perfect for just about any meal. If you’re looking for that delicious meatless dish for breakfast, brunch, or dinner, then this is it! Springform pans and I have a rocky history. When I was just starting to get interested in baking right after college, I decided to make a cheesecake. Since I didn’t own a springform pan, I borrowed one from my aunt. I also called it a “springfoam” pan, which just goes to show how far I’ve come with baking terminology. Anyways, after I mixed the cheesecake batter, I decided to put the pan into a water bath so that the cheesecake would cook evenly. Now, maybe you can see where this is headed…my water bath quickly turned into a cheesecake bath, as the water seeped into my springform pan and promptly ruined the batter. That was the end of my relationship with springform pans for a while. Fast forward years later, and I’ve worked up the courage to use those pans again. Usually, without the water bath, just incase disaster decides to strike again. However, my bad luck with springform pans decided to resurface with this Spinach and Feta Frittata. But, let me back track just a little. I love watching the Food Network and try to catch “The Kitchen” when it’s on during the weekends. In one of the episodes in May, Katie Lee (one the chef’s) stated that she loves using springform pans for frittatas, because then you can just peel the sides away and present it on a cake platter. After all, it’s all about presentation! So, when I decided to whip up this healthy Spinach and Feta Frittata for breakfast, I grabbed my trusty springform pan, poured the mixture in, and started to cry as it all seeped out onto the counter. So, maybe I’m being just a bit over-dramatic. It could be that the sides just didn’t close tight enough, or, it could be that springform pans and I just don’t mix for anything other than cheesecakes. But, the moral of my story is that I made this recipe using a round cake pan, and it turned out just as pretty as if I had made it with a springform pan. 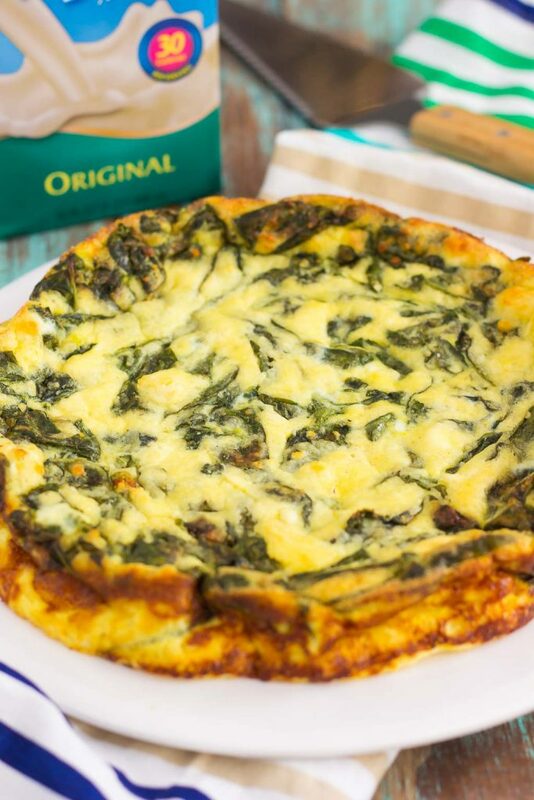 Now that I got that out of the way…let’s talk about this healthy Spinach and Feta Frittata! This protein-packed egg dish is full of fresh spinach and creamy feta cheese. It’s healthy, gluten free, and perfect for just about any meal. If you’re looking for that delicious meatless dish for breakfast, brunch, or dinner, then this is it! I am a huge lover of frittatas. It’s perfect for breakfast, it’s delicious for lunch, and it makes a tasty dinner. Frittatas also make the most fantastic leftovers for an easy breakfast or dinner throughout the week. Basically, frittatas are the best to devour whenever and wherever. Am I right? Especially this Spinach and Feta Frittata. It literally takes just about 10 minutes of prep time, and then you throw it into the oven to bake. Easy peasy! And to make this frittata just a little bit more nutritious, I reached for Blue Diamond Almond Breeze Almondmilk. It provides just the right amount of flavor, packed with a bit of protein. 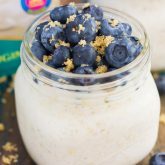 You may recall that I made these Blueberry French Toast Overnight Oats with Almond Breeze. And if you were following along, you may also remember that Blue Diamond Almond Breeze is helping fuel Team USA Volleyball athletes. 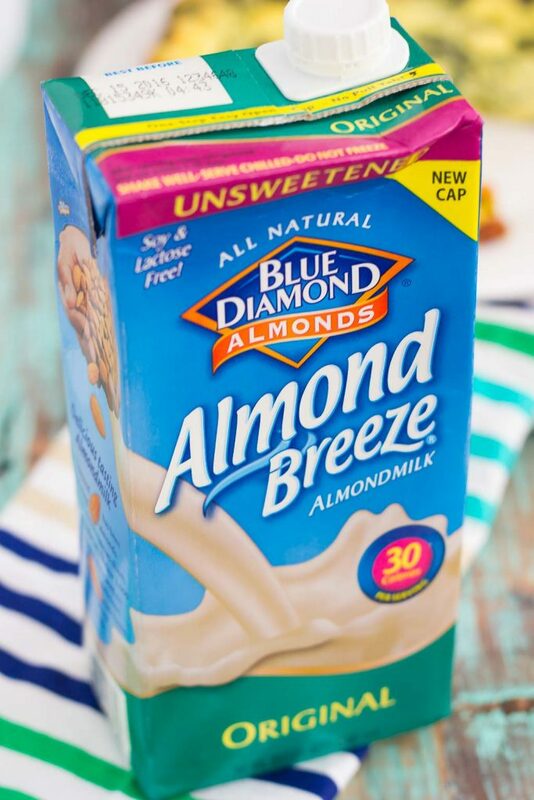 Since Almond Breeze believes in the best, they only use Blue Diamond Almonds to make their almondmilk. They’re also a proud sponsor of USA Volleyball. To get a chance to have some fun, visit www.ServeUpYourBest.com for a chance to win $5,000 for the ultimate beach day, learn volleyball moves, get an Almond Breeze coupon and smoothie recipes! 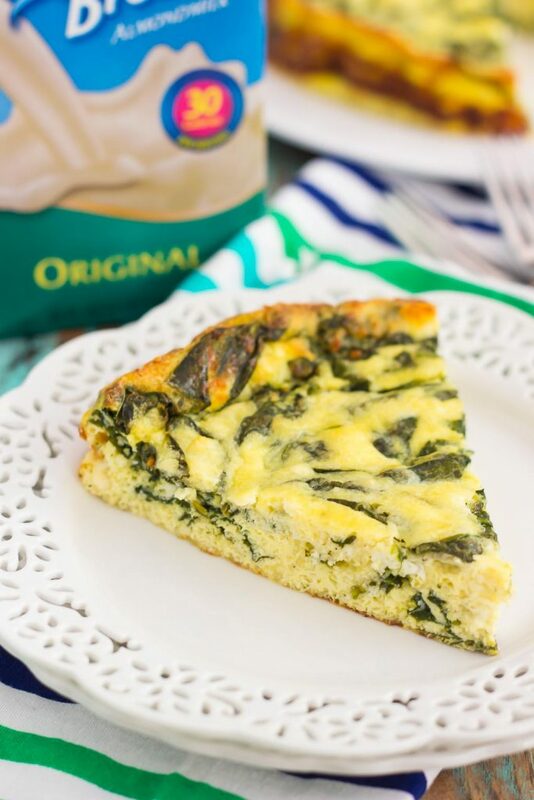 So, to help celebrate Team USA Volleyball and Almond Breeze, I thought this easy Spinach and Feta Frittata would be the perfect dish to share. It’s healthy, full of flavor, perfect for any meal, and simple to make. It’s also screams summer and fresh ingredients. Whether you’re in need of breakfast for the week, a simple brunch dish, or a meatless Monday dinner, this easy frittata was made for you. So grab those ingredients and whip up this flavorful dish today! 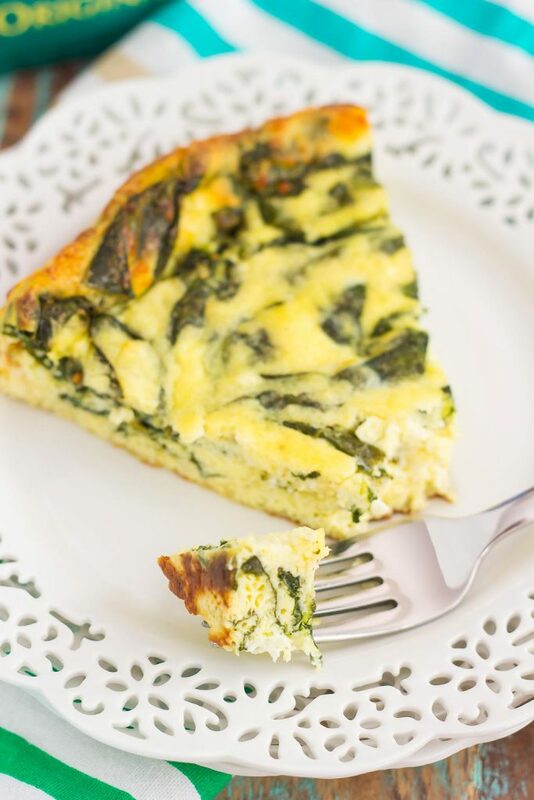 This Spinach and Feta Frittata is full of fresh spinach and creamy feta cheese. It's healthy, gluten free, and perfect for just about any meal. If you're looking for that delicious meatless dish for breakfast, brunch, or dinner, then this is it! Preheat oven to 350F. Lightly spray a 9-inch round cake pan with non-stick cooking spray. Set aside. In a large skillet, heat olive oil over medium heat. Add spinach and cook until wilted. Season with salt and pepper, if desired. In a large bowl, whisk eggs, Blue Diamond Almond Breeze Almondmilk Original Unsweetened, salt, pepper, and garlic powder. 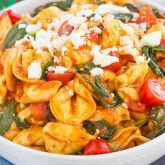 Fold in cooked spinach and feta cheese. Bake for 32-25 minutes, or until firm and toothpick inserted in middle comes out clean. Oh, you poor thing. I would've cried too. My springform pans don't fail me, but my bundt one does all the time. I'm starting to have quite a complex. Luckily, your final result was excellent! I love spinach and feta. Best combo. I've never had a problem with bundt pans before (knock on wood)! Thanks for the kind words, Mir! Oh no I think I would have cried too. At least it all turned out well in the end. The combination of spinach and feta remindes me of Greece. I love how easy frittatas are too! 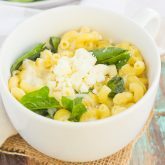 I bet you had the best spinach and feta dishes in Greece, Dannii! Thanks for the kind words! This is my kind of Monday breakfast! I'm always down for eggs in any and every form, but ESPECIALLY when it involves spinach and feta. Need this in my Monday morning asap!! Spinach and feta really do make eggs better! Thanks for the frittata love, Sarah! I completely feel your pain with those springofoam...or springform pans, Gayle ;) Well, who cares about 'em anyway, right? I've had disasters with them too when making cheesecakes with the water bath and having my nice crust get all soggy. So, now, it's no water bath for me! I love frittatas and make them regularly. Usually hubby and I will have them for lunch. Plus, they are a great way to use up some veggies in the fridge. Love this version you have here, especially love the addition of feta...one of my faves :) So many good things going on and good for ya! Pinning, of course :) Have a great week! I've given up water baths, too! Just not worth the pain! :) Thanks for the frittata love, friend! Aren't they one of the best dishes to make? Oh no, that would be so frustrating! I hate it when tools don't cooperate! This quiche looks and sounds delicious! I feel the same way about springform pans! but now I know how to use one. . finally! :) it's crazy how much baking "gear" I have accumulated since starting the blog! :) Gayle, I love that you added almond milk into this frittata!!! what a brilliant idea! love this! Yes! I feel like I'm swimming in baking dishes, food props, you name it! :) Thanks for the kind words, Alice! Lol.. so I shouldn't get you a springform pan for Christmas, huh? ;) I have a love-hate relationship with those things too! When they work, they work wonders.. but when they don't they make we want to bang my head against a wall. So I feel you. Looks like springform pans can take a back seat as far as frittatas are concerned because this one turned out WONDERFUL!! 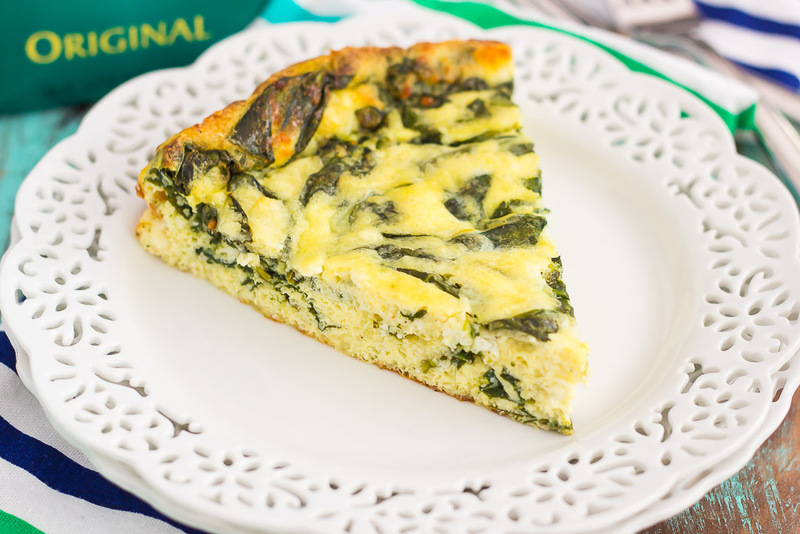 Love spinach and feta together, but combine those with some fluffy egg frittata action?! YESSS! SO GOOD! Pinned! Cheers, friend! You might just have better luck with springform pans than I do, Cheyanne! I was able to get it to work with my no-bake cheesecake, but that's about it! :) Thanks for the frittata love and pin, friend! Haha yes! Take that, springform pan! :) Thank you, Annie! Springform pans can be so difficult! I think I finally have a godo one because I haven't had any issues with it, but I have had my share before! I am all about frittats too -- we love eggs any time of day! I totally agree that frittatas are the best any and everywhere! They are so versatile and this one sounds so delicious! Thank you for sharing. Oh no, springform pans can definitely be tricky but I'm so glad that this frittata totally didn't need one :) It looks perfect and would be a hit for breakfast, lunch and dinner! Love the spinach and feta combo! I once made a deep dish mushroom quiche in a springform pan. At first it seemed like everything was OK, but then I smelled burning. I opened the oven and my quiche was slowly leaking out of the pan. Lol. Cleaning that up was memorable! ???? This is just the kind of meal I love in the summer. Not too heavy and full of wonderful flavors. It doesn't get much better that feta cheese in a frittata! Aww that's the worst when it's burning in your oven! Thanks for the frittata love, Amanda! YUM! This looks perfect! I love the flavors you have going on here. 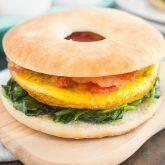 I need to add this to my breakfast-recipe list! Thanks for the frittata love, Annie! Yes, that's my relationship with springform pans, too! Thanks for the kind words, Karrie! springform pans can be difficult to handle. hate when they leak!! Glad the recipe worked out with a round pan, the frittata sound fabulous! I never use my springform pan! :) Frittatas are some of my favorite healthy and easy make-ahead breakfast options. This combo sounds simple and delicious. Perfect! I've decided that I will only use my springoform pan for cheesecake and nothing else! :) Thanks for the frittata love, friend! I haven't had trouble with my springform pan, but mainly only use it for coffee cakes and the like! I can see how it would cause trouble however...ugh! I have a thing for frittatas, especially when they're on the healthy side like this! The flavors here are just perfect, and I love my almond milk! I've definitely learned my lesson with springform pans! :) Thank you for the kind words, Marcie! I've also had problems with springform pans!!! Not fun! This frittata looks awesome! Love spinach and feta! And this is my favorite almondmilk! Thanks, Mira! This is my favorite almond milk, too! Thanks for my future brunch recipe! I've been needing something new so this came at the a perfect time! I love that I can substitute veggies in this depending what's in season too! Thank you, Pamela! This is the easiest dish that is perfect to customize!